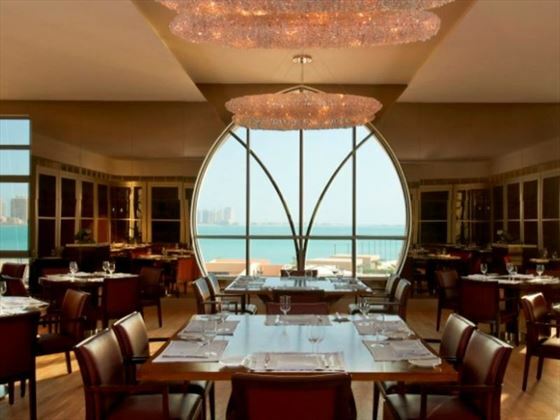 Situated in the heart of the West Bay in Doha, the St Regis emanates a luxurious and traditional ambience. This hotel really is the perfect choice if you’re looking for that spark of elegance and sophistication – it’s present in every feature from the majestic décor to the indulgent Remede Spa. To add that extra special touch, everyone who stays at the hotel has their own personal butler for the duration of their stay. The gorgeous private beach provides the perfect setting for soaking up the tranquil atmosphere and enjoying the picturesque views from the shore. If you want to indulge a little further, head to one of the ten bars and restaurants where you can sample the local delicacies prepared by a world renowned chef. Fitness fans can keep fit in the exercise room, or swim a few lengths of the outdoor pool before relaxing in the hot tub. Or, if you’d rather, you can head to the St Regis boutique for a spot of souvenir shopping. 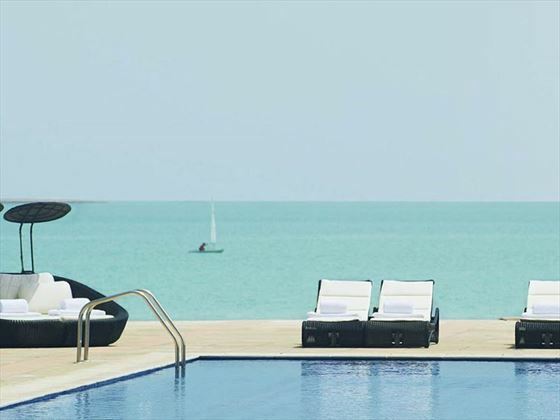 The hotel forms part of the Al Gassar Resort and is located within the heart of West Bay, a newly developed neighbourhood in Doha. Transfer time from the airport – approximately 35 minutes. 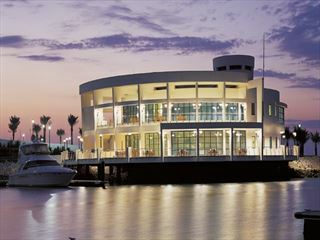 Superior Rooms – with partial sea views and a king-size or two double beds and sleep up to three adults. 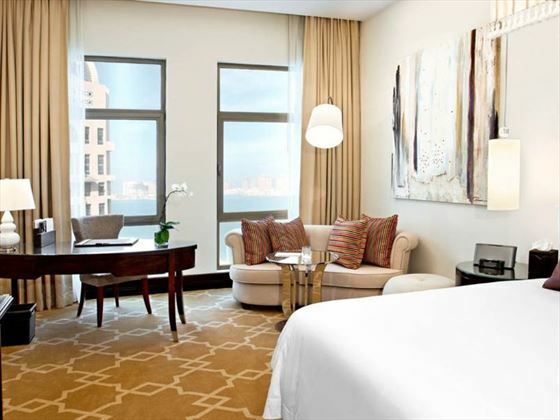 Grand Deluxe Rooms – have a full sea view of the Arabian Gulf. Some Grand Deluxe rooms have a private terrace and sleep up to three adults. 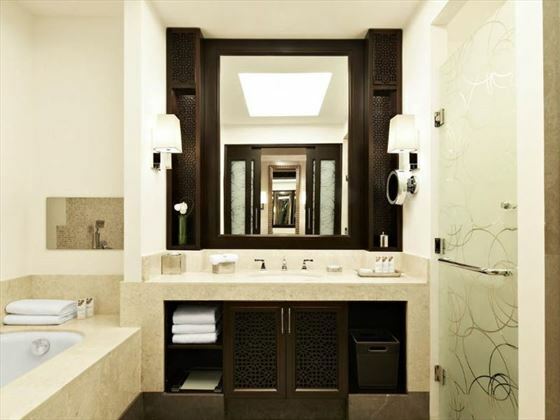 St Regis Suites – have one bedroom with a separate living room, views overlooking the Arabian Gulf, and a walk-in wardrobe. Some St Regis Suites have a private terrace and are located on the lower floors, with views overlooking the rooftop garden These suites sleep up to three adults. Empire Suites – have two bedrooms with unrestricted views of the sea, a generous living room with dining table and a private study. 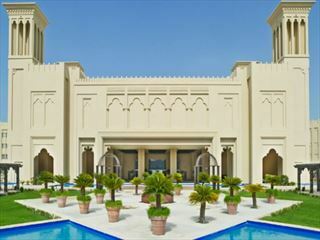 They also receive complimentary Al Maha Gold Service for 2 people. Empire suites sleep up to five adults. 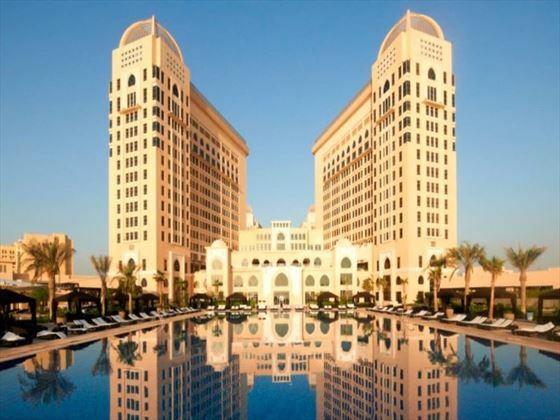 The hotel has an enormous outdoor swimming pool which is serviced by St Regis butlers throughout the day (children under the age of 6 are not permitted in this pool). There is also a whirlpool and hot tub. Guests also benefit from a private beach with cabanas. With 22 private treatment rooms, the elegant Remede Spa offers a number of signature rejuvenating treatments by experienced spa therapists. Choose from body wraps and polishes, to reflexology and hot stone treatments or pamper yourself with a customised facial – designed to your exact complexion needs. 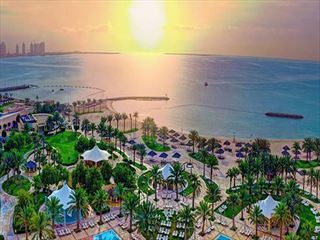 Children will love the Kid’s recreation and entertainment area with a TV and play zone, and a mix of exciting activities including Lego building contests, face painting, art projects, beach and board games, Middle Eastern arts, X-Box, Play Station and Wii plus treasure hunts. Children’s menus can also be found in all of the hotel’s restaurants. Approx. 20 Aug ’18 for 2 nights – no alcohol will be served in bars, restaurants or hotels. Please ensure you are aware of these restrictions.